Have you met some of X-CORE's most amazing women? We knew they were special the moment they walked through our doors. Genuine, thoughtful, and FUN...this ride or die crew has given so much to X-CORE through their passion for life and tight friendship. They've been a crew for over 6 years, but their roots go back to over 34 years! Leah: I’ve dropped down 2 sizes since starting X-CORE over a year ago, I feel stronger and feel better than ever. 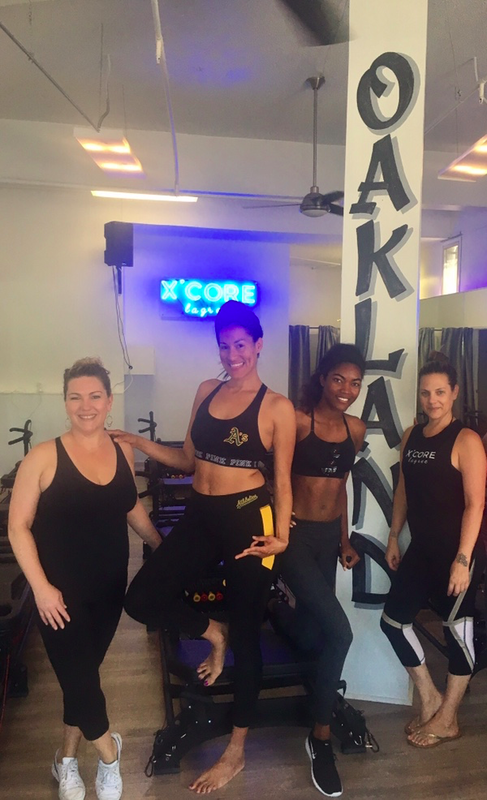 Jada: Such a supportive and motivating group...X-CORE has made me want to work out! Cameron: I’ve lost 15 pounds & feel great! I’ve improved my overall health in a measurable way and continue to look forward to class. I always feel better after class & can bank on the day's stress melting away. I think we all appreciate the encouragement & motivation we not only get from each other, but the positive X-CORE community. What’s that “thing" that keeps your friendship tight? Don't sweat the small stuff and we laugh a lot! Mexico, Tahoe, Yosemite, Las Vegas, Bahamas, Spain, Morocco, LA, and Yuba River. One of our favorite things to do is travel around Oakland on our bikes. What's your favorite day time hang out spot in Oakland? 1888 coffee station AKA “the stoop” - you can catch us here every Saturday & Sunday after X-CORE. What's your favorite night time hang out spot in Oakland? Oeste, Somar, District and Shakewell. After X-CORE it’s Whole Foods or Kinja. Cameron: It gives me strength and happiness in 40 min, and I get to spend time with my girls. Syd: It's a great 40 minute total body workout. Plus the community at X-CORE makes you want to show up and commit to changing your body. Leah: It challenges me and after a long day at work it takes away any stress I may have had... and I get to spend more time with my girls! Jada: It makes me feel strong...and it's the first workout I've been committed to this long - in years!